The paper examines the phase formation in the mechanochemical treatment and subsequent annealing of TiO2 and MgO mixtures. It is established that the MgTiO3 phase forms during annealing of the above powder mixtures at 900, 1000, and 1100°C. Preliminary grinding of oxides in a high-energy planetary-ball mill after annealing produces the MgTiO3 phase within its homogeneity range. The lattice parameters are determined at the boundary of the homogeneity region. Preliminary grinding of the oxide mixture produces the spinel-type Mg2TiO4 phase. 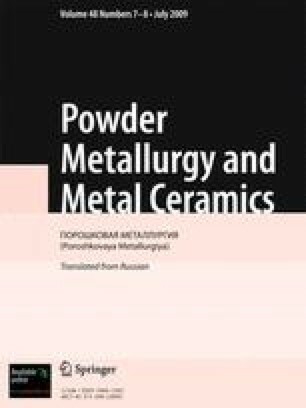 Translated from Poroshkovaya Metallurgiya, Vol. 48, No. 7–8 (468), pp. 3–7, 2009.